This is double tasting with a difference, only one of them is a Whisky, with the other being a new gin. It is early evening on Monday 21st February in Jim’s hoose, Nicola is still in Las Vegas, so Jim got his wife Jacqueline to help with his tastings as her favourite tipple is a gin and tonic. 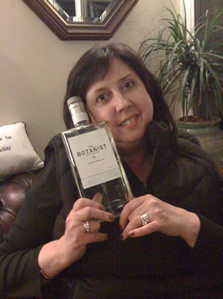 So the first tasting of the evening was the Gin. Bruichladdich (pronounced ‘brook-laddie’) which is Gaelic, and refers to a raised pebble and sandy beach upon which the distillery stands. 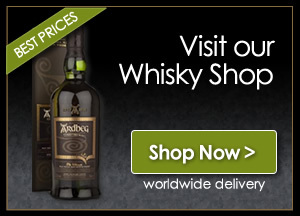 You should all visit the website and check out all the products that this grand distillery produce, a visit or three is always on Jim’s list when he goes Islay. So lets not keep Jacqueline waiting any more, pour out the gin. Nose…Complex floral notes, a little hint of pepper. Taste…With the addition of some ice and Sainsbury’s diet tonic water, you have an explosion of tastes and flavours, very evidently gin but so much dryer and sharper than any other gin I have sampled, a masterpiece. Finish…Sweet and creamy layers on the tongue, and absolute delight. Nose…Juniper berries are way out there with loads of perfumed notes. Taste…Also with ice and diet tonic water, an ever so refreshing perfumed and dry gin, beats all the others including Gordon’s, Beefeater, Hendrick’s and Tanqueray easily. Finish…Love the clean dry floral flavours running around my mouth. This is a great addition to Bruichladdich’s product range, well done to Jim McEwan and all his team. You can buy this fabulous gin direct from the distillery via their website, but not many on-line suppliers have it in stock, but you can buy it from Master of Malt for only £24.95, I hear you saying “that is a little expensive”, but trust us it is so well worth every penny. Now lets move onto the Whisky!! 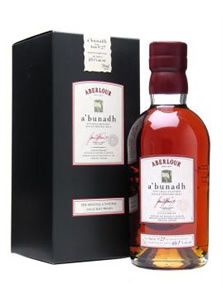 Aberlour A’bunadh, Batch 31, Speyside Single Malt Scotch Whisky, 60.5% Alc/vol. 70cl. This dram is also the Whisky Boy’s Malt of the Month for February 2011. The meaning of A’bunadh is from the Gaelic for ” of the origin ” and this dram is exclusively matured in Oloroso sherry butts and is always at cask-strength. No more to be said lets get down to tasting this little beauty. Nose… Rich elegant sherry notes, spicy and citrus. Taste…Cherries by the punnet full, Bourneville dark chocolate, some oakiness in there too, cream and sherry soaked fruit. Wonderful. Finish…Chocolate and spice lingering on and on. Nose…Sherry from the schooner of and old aunt, rum and boozy raisins. Taste…Sherry cannot be missed, Terry’s chocolate orange, quite chewy. Finish… The taste and flavours go on forever. Well done all at Aberlour this is a triumph of a dram, not available in all your local supermarkets but you should be able to obtain a bottle from your specialist Whisky shop and certainly on line, the Master of Malt will supply you a bottle for only £36.45. We cannot rate this highly enough and the Whisky Boys are making sure that they have a bottle or three at all times in our cabinet. If you go out and buy a bottle remember to tell them the Whisky Boys recommended this dram. Sold Out – Ladies Only Whisky Club!! You tasted a 4 corker without me… we don’t give that score away too easy on this site, it must have been a beauty.